Hot tubs offer a great way to ease stress or bond with a loved one. But there are times when you just want to have them removed fast. However, you can’t rely on just anybody to do the job, as this might cause more harm than good. 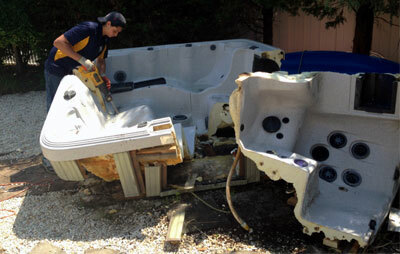 For the fastest yet top notch quality hot tub removal in New Jersey, 1-844-JUNK-RAT is the only service company to go. Round or oval, freestanding or not, your hot tub removal needs in New Jersey will be properly taken care of. If you choose us, you won’t have to lift or load anything – our professional junk haulers can get the done job in a jiffy. The best thing about our hot tub removal services in New Jersey is that they come in ridiculously low rates. In fact, ours are whopping 25% lower than our major competitors. This only means that if you keep choosing our local junk removal company for your junk removal needs, you’ll enjoy significant savings!